In 1807 Samuel C. Isachar Ber, who had printing presses in several towns, set up a press in Berdichev, initially as a branch of his Ostraha house. Samuel and after 1817, his son Jacob Funkelman, operated there until 1820, when the business was transferred to Szdelkow. Altogether they printed over 30 works on hassidism, kabbalah, and halakhah in addition to prayer books and popular books in Yiddish. 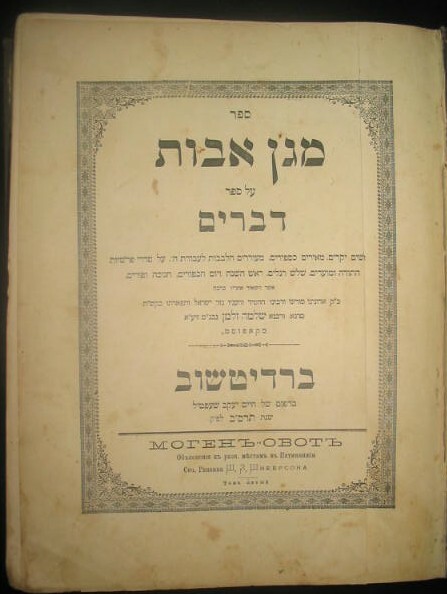 Another printing was established by Israel Bak in 1815-21. Before his emigration to Eretz Israel in 1831, he produced 26 works on roughly the same subjects, most of them set in a new typeface designed and cut by Bak himself, with his own illustrations. 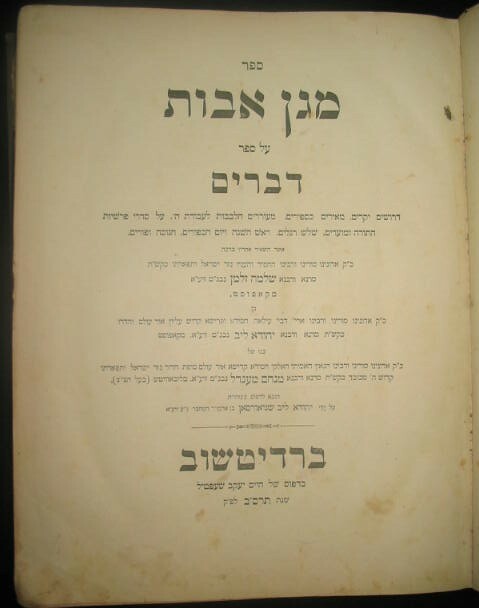 Other Berdichev printers were M. H. Rothenberg (1834-1836), and H. J. Sheftel (1885-1910), the latter published a great number of scholarly works, including a popular edition of the Babylonian Talmud (with Rashi) in one volume (1894). Magen Avot. Authored by Rabbi Shlomo Zalman ben Rabbi Yehuda Leib. A grandson of the Zemach Zaddik and Baal Hatanya of Lubavitch. Served as Rabbi in Kapust [Kopys]. Volume 5, Devarim, Rosh Hashana, Shabbat Shuvah, Yom Kippur, Succot, and Shmini Atzeret.